The Norman Clare Collection at Thurston, St. Anne Street, Liverpool is probably the largest collection of billiards & snooker memorabilia in the world. This unique collection of Billiard & Snooker memorabilia encompasses many items linked to the billiards and snooker industry. Memorabilia of the billiards and snooker industry. 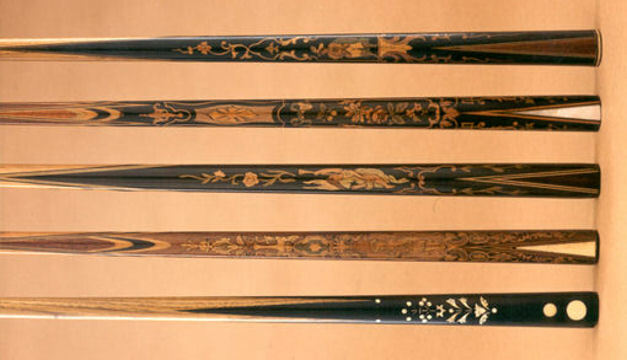 Marquetry cues like this are commonly called French cues and show the high skills of the 19th century cue makers. The Norman Clare Collection at Thurston, St Anne Street, Liverpool, is problably the largest collection of billiards and snooker memorabilia in the world. Only the Heinrich Weingartner museum in Vienna compares with it and that is devoted to carom billiards. Norman Clare, who died in 1990, was Chairman of E.A. Clare & Son Ltd having followed his father (Edward Arthur) into the business as a young school leaver in 1930. The company [whose interest in the billiards and snooker industry encompasses the historic Thurston name as well as those of Thos. Padmore and Sons, Ashcrofts, Peradon, Weilding, and many others] is the home of Norman's collection. His interest in setting up this collection stemmed from when E.A.Clare & Son bought Thurston & Co. and he found many interesting items at their old factory site at Waterloo Works, Cheyne Walk, Chelsea. Part of the Norman Clare Billiard & Snooker Heritage Museum at Thurston's Liverpool offices is a significant Billiard / Snooker cue collection and given that there are specialist collectors interest in cues, in the UK and USA, it was decided not only to catalogue the collection but also photograph them and add the information to the web site. The collection was started by Norman Clare and ranges from fine examples of early maces and French marquetry cues through endorsed players cues and Billiard Company models.